Garmin International Inc., a unit of Garmin Ltd. (NASDAQ: GRMN), today announced the Forerunner 225, the first Garmin GPS running watch that measures heart rate at the wrist. The Forerunner 225 will integrate industry-leading optical heart rate technology developed by Mio, an award-winning performance wearables brand acclaimed for EKG accuracy demanded by athletes everywhere. The Forerunner 225 features a colorful graphic interface showing runners their zone and beats per minute at a glance, and a built-in accelerometer that provides distance and pace data for indoor running with no need for a separate foot pod. To keep runners active between workouts, it doubles as an activity tracker counting steps, calories and distance. A move bar with vibration alert reminds users when they've been too inactive, and sleep monitoring for ample recovery. "After more than 10 years of developing GPS running watches we are very excited to team up with Mio to introduce our first device featuring wrist-based heart rate," said Dan Bartel, Garmin vice president of worldwide sales. "Getting and understanding your heart rate is more comfortable and easier than ever with the Forerunner 225's real time results on a colorful gauge - allowing runners to evaluate and adjust effort quickly so they can focus on their run." 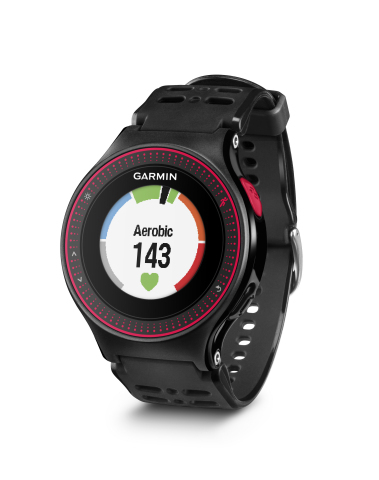 "We are proud of our partnership with Garmin. When the leading brand in GPS teams up with a leading brand in wrist-based heart rate monitoring technology, it's a win for athletes at all levels," says Liz Dickinson, CEO of Mio Global. "More and more, athletes are recognizing the role that heart rate plays in their training intensity and efficacy, and it has become evident that heart rate is a must-have feature in wearable technology." To measure heart rate at the wrist the Forerunner 225 uses a built-in optical sensor that shines light into a user's skin and measures the amount of light returned. Because there are slight changes as blood pumps through the wrist, the sensor detects those changes and uses an advanced filtering process to determine reliable and accurate heart rate. Additionally, a light seal on the back of the watch blocks out ambient light to help ensure proper heart rate detection. The Forerunner 225 displays a colorful gauge to show a runner's zone and beats per minute in real time, allowing users to easily follow training programs that require set times or distances within a certain zone. The gray, blue, green, orange and red areas on the gauge show runners at a glance if they are in the warm-up, easy, aerobic, threshold or maximum heart rate zone. Zones are preset based on the user's age-based max heart rate estimate but can also be customized directly on the watch or in Garmin Connect™. Between workouts the Forerunner 225's activity tracking features monitor valuable data including steps, distance, calories burned, and sleep, and its move bar with vibration alert provides motivation to stay active all day. Garmin International Inc. is a subsidiary of Garmin Ltd. (Nasdaq: GRMN). Garmin Ltd. is incorporated in Switzerland, and its principal subsidiaries are located in the United States, Taiwan and the United Kingdom. Garmin and Forerunner are registered trademarks. Garmin Connect is a trademark of Garmin Ltd. or its subsidiaries. Mio Global is an acclaimed pioneer in sport and fitness wearable technology. Mio sport bands and watches are equipped with industry leading heart rate accuracy and fitness tracking solutions to help athletes at all levels set and surmount their fitness goals. The company headquarters is in Vancouver, Canada. For more information, visit www.MioGlobal.com. This release includes forward-looking statements regarding Garmin Ltd. and its business. Such statements are based on management's current expectations. The forward-looking events and circumstances discussed in this release may not occur and actual results could differ materially as a result of known and unknown risk factors and uncertainties affecting Garmin, including, but not limited to, the risk factors listed in the Annual Report on Form 10-K for the year ended December 27, 2014, filed by Garmin with the Securities and Exchange Commission (Commission file number 0-31983). A copy of such Form 10-K is available at http://www.garmin.com/aboutGarmin/invRelations/finReports.html. No forward-looking statement can be guaranteed. Forward-looking statements speak only as of the date on which they are made and Garmin undertakes no obligation to publicly update or revise any forward-looking statement, whether as a result of new information, future events, or otherwise.